With four and a half hours journey between each of them, Jaisalmer, Jodhpur and Udaipur are three important cities of Rajasthan, united by its magnificent palaces and forts and divided by the other diverse elements – both of which lures travellers from around the world to witness the rich heritage. While both Jodhpur and Udaipur are bound to woo you with what is still preserved of a bygone regal era, Jaisalmer is the perfect spot for the adventure junkie. Hence travelling to all three cities is for sure going to be a potpourri of experiences. ‘The Golden City’, situated at the heart of the Thar Desert is known so for a reason. The forts and the towns of the city are mostly constructed out of yellows sandstone, which turns golden yellow upon reflecting the sunlight. Otherwise, the name Jaisalmer comes from a Rajput king who founded the city in 1156 AD – Jaisal Singh. The Jaisalmer Fort is apparently one of the few living forts in India, for a good portion of Jaisalmer’s old city still lives inside the fort. The ‘Queen of Thar’ is a melting pot of tourism activities. You can start your day relishing the historical charm of the place, by visiting the Jaisalmer Fort. But the sand dunes are all waiting to evoke the adventure junkie in you. There are myriad activities to choose from, that happens in the desert. You can try out the desert safari you thought was probably possible only in Middle Eastern countries in Jaisalmer. Apart from that, there is Parasailing, Quad biking and Camel safaris, among others. Camping in the deserts can be simple, as well as a luxurious experience. Either way it is sure to blow your mind, especially at night when you can watch a sky full of stars, making it look surreal. You can also visit the Indo-Pak border and Gadsisar lake too, however, if you have thing for spooky stories, then Kuldhara village is a must visit. There are many havelis in the city that are nothing short of jaw-dropping architectural marvels. From the heart of Thar Desert, you now move a little towards the side, to Jodhpur, the city founded by Rao Jodha in 1459. Jodhpur is said to be where you can see the sun rising first, and hence it is called Sun City. Because of the vast spread of blue coloured houses, it also came to be known as Blue City. 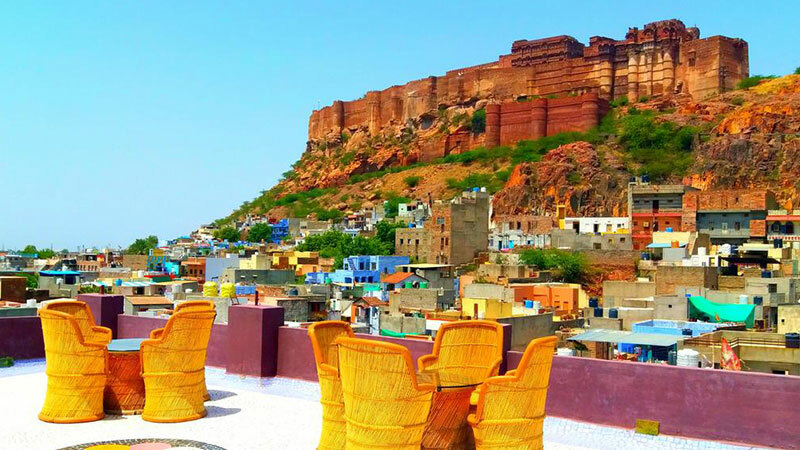 Jodhpur, too, has forts and distinct features that make the city uniquely beautiful. Wrapped in breathtaking beauty and folklore is the ancient Mehrangarh Fort, one of the largest forts in India. Built out of red sandstone, it is a sharp contrast to the sea of blue houses in its valley. The fort, with high walls for boundaries, is 410 feet above the city and on its walls, have marks of cannon balls, and hand imprints of the women who committed sati centuries ago. The museum inside the fort showcases artifacts that once belonged to the kingdom. Once you are done with the sightseeing, you can also get into some adventure by zip-lining with the Flying Fox Jodhpur. The Rao Jodha Desert Rock Park, once a waste land which has now been converted into a desert rock park, is a perfect spot to go exploring and trekking. The Jaswant Thada is yet another architectural marvel you must not miss. It is a cenotaph built by Maharaja Sardar Singh in memory of his father. The white marbles that were used to build the cenotaph emanate a warm glow as the sunlight hits it. The clock tower in the city and the markets situated around it is the place to go if you’re planning on doing some shopping. With its lakes and palaces, Udaipur looks every bit regal. Hence, it has been fittingly called the ‘City of Lakes’, as well as ‘Venice of the East’. The city, founded by Maharana Udai Singh II in 1553, is always bustling with activities, waiting to offer you diverse experiences. Hence, it might be quite a task to fit all the places and experiences into one day. Situated in the banks of Lake Pichola is the Udaipur City Palace, consisting of four major and other minor palaces. Apart from the balconies, cupolas and towers that speak volumes about the architectural marvel that the palace is, it also has a museum displaying the belongings of the royal families. Take a boat ride in the Pichola Lake. Head towards the popular Lake Palace next. This palace, which has now been converted into a luxury hotel, has been the location for many movies. To explore more on the Mewar culture, drop by at Bagore Ki Haveli and the museum that displays antique collection belonging to the Rajputs. You’ll find everyday items such as jewelry boxes, copper vessels, etc. If you are a motor head, then the grounds of Garden Hotel is a must-visit. They have a collection of vintage car that were mostly used by the maharajas. After shopping for traditional stuff at Shilpgram, watch the sunset at the Monsoon Palace. On the 7th day, your trip comes to an end. Our agent will drop you at the airport or railway station. With bundles of memories, you head back home.